I have been waiting for about nine months to try the new vegan menu from Balducci. I was aware of the exciting launch by one of Cape Town’s most established and well-known restaurants, but could only watch the action from afar as I have been based in Durban for the last two years. However, I finally had a few days in my hometown and managed to sit down to try their food. Upon looking at the menu, I was overwhelmed! I had never seen such an extensive vegan menu at a non-vegan restaurant in Cape Town - ever. And everything sounded so good! Choosing what to eat was a challenge but luckily I had my partner in crime with me, which meant we could split a few options between the two of us. This meant drinks, starters, mains and desserts (and a planned second visit in the future). Attempting to keep a poker face while silently stressing about whether I ordered the right food. Right, so we know that there’s a big increase in interest in veganism both globally and in South Africa as more people are becoming aware of the important environmental benefits and health perks that a plant-based diet offers. 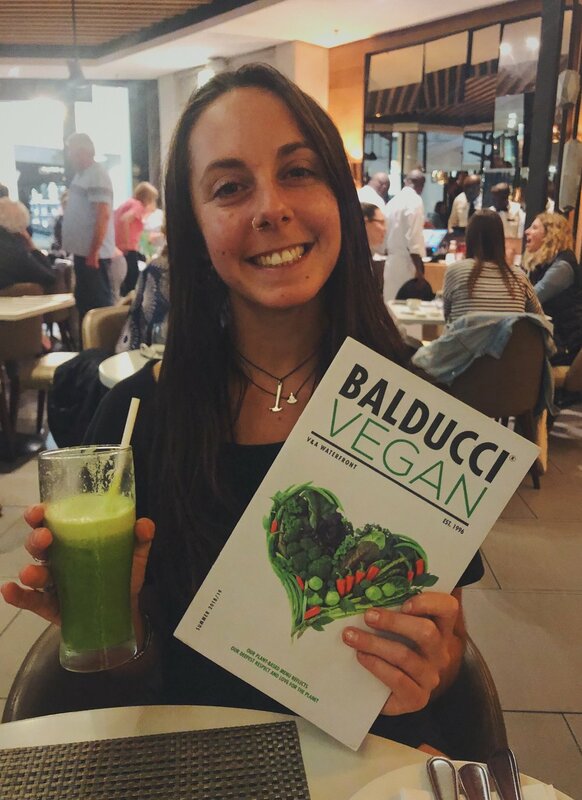 In response, Balducci got busy behind the scenes and meticulously crafted a plant-based menu, complete with over 50 different options - yes, you read correctly - over 50 menu items that are entirely meat-free, egg-free and dairy-free! They have ticked all the boxes with a selection of smoothies, smoothie bowls, various cold and hot drink, salads, bowls, burgers, pastas, pizzas, sushi, wraps and desserts. Basically, you are bound to find an array of things to try (and will be planning your next trip back there in no time). So what did we order? A Classic Green Juice: Pineapple, apple, fennel, kale, parsley, lemon, lime juice and ginger. Guacamole Rice Paper Wraps: Guacamole, carrot, cucumber, bell pepper, red cabbage, wrapped in rice paper and served with a vegan satay sauce. Cashew Nut Cream Pasta: Marinated tofu and smoked mushrooms in a cashew nut cream sauce, with linguine pasta and vegan Parmesan on the side. Roasted Tofu and Vegan Satay Sauce Pizza: Vegan cheese and tomato base, roasted tofu and topped with peanut butter satay sauce, on a homemade pizza base. Cheesecake: Vegan cheesecake with a berry marble swirl. Pistachio Raspberry Ice Cream Cake. What is next on my list to order when I visit Balducci again? Turbo Something Juice: Pineapple, apple, spinach, celery, cucumber, lime and avocado. Onion Blossom: Giant onion seasoned and deep-fried, served with a vegan chipotle mayo. Trader Joe Pizza: Mixed chopped peppers, red onion and mushrooms topped with dairy-free cheese and a sprinkle of vegan Parmesan and vegan pesto. Smokey Black Bean Burger: Smokey amaranth black bean burger, served with sweet potato fries or salad. Red Thai Curry: Prepared with whole fungus mushrooms, tofu, bamboo shoots, cauliflower and broccoli, served with basmati rice. Tahini Vegan Shake: Banana, dates, tahini, almond milk, vanilla and cinnamon. Pina Colada Smoothie: Coconut water, mango, pineapple, baobab powder, lucuma powder, agave nectar, mint and pineapple. I was also super impressed with the beautifully crafted vegan menu. It’s separate from the other menu and include meals that aren’t in the main one - so definitely ask to see the vegan version. It’s really well designed and put together. There’s a whole section on why Balducci decided to create a vegan menu, their values and promise to non-GMO and organic ingredients, to be plastic-free and preservative and chemical-free, to use non-irradiated herbs and spices, and to cook at low, slow and delicate temperatures to ensure the integrity of the ingredients are retained and bioavailable. It was lovely to read their ethics while waiting for the food, adding a great touch to the overall experience. If you live in Cape Town, this restaurant that is a must-try, and if you’re visiting Cape Town on holiday, I highly recommend it too. It’s smart enough for a business meeting lunch, chic enough for date night, varied enough for a family dinner, and comfortable for a meal alone. Balducci, thank you for the wonderful vegan dining experience! I can’t wait to return.